This is a strange picture to illustrate Daryl's poetry prowess. 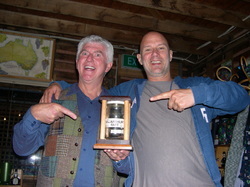 It is UK-based folk-singer Keith Donnelly and Daz with the coveted trophy (MacArthur's Fart) from the National Folk Festival Great Poetry Debate. Keith and Daryl were on the winning team in 2006. Daryl not only competes in poetry debates (that is where normal debating rules apply BUT the debate must be conducted in rhyme) but also regularly performs at Poets' Breakfasts on the folk-festival circuit. He also uses poetry in his children's shows. Daryl appeared at the CJ Dennis Poetry Awards at Toolangi, Victoria in November 2011 and walked away with some prestigious awards. You would expect Daryl's poems to be humorous.